Training for Ice Climbing? Time to dial it up! Icing on the Climbing Cake–more specific strength for ice climbing. Ice climbing is a different beast. Solid general fitness and specific strength is key to success. If you’ve been following the Chicks Training tips recently you know about the last two ice-climbing-specific workouts. Swing! 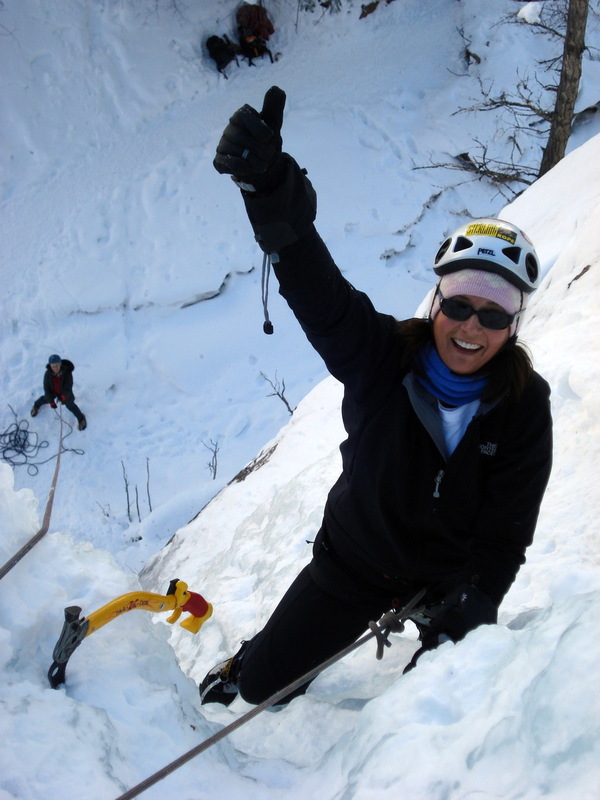 Training for Ice Climbing helps build ice climbing fitness from a solid fitness base. 10 Steps to Muscular Endurance for Ice Climbing gives you some tips for using a climbing gym to build ice climbing fitness. Indoor climbing can help with grip strength and stamina. Climbing indoors with a pack will increase your pump and add core strength and muscular endurance. Now it’s time to dial in a couple more pieces as well as take things up a notch. Are preparing for an upcoming Chicks clinic or ice climbing trip. 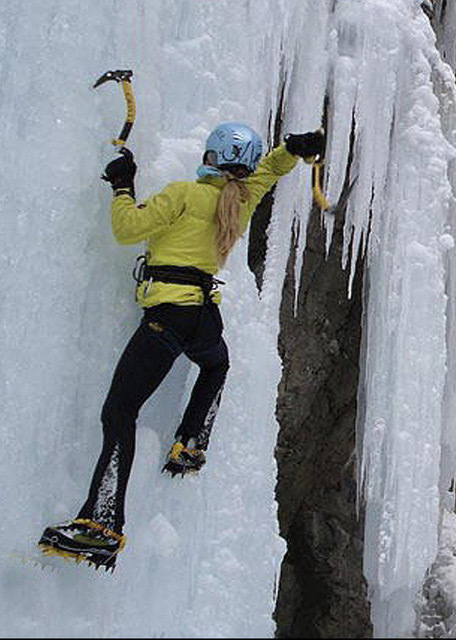 Train your Arms, Grip and Calves for Ice Climbing. The technique you use for this workout will depend on where you are with your pull up strength. The following three videos show pull-up variations. The final one shows the lock off training sequence. Do Pull ups on dowels or your ice tools placed over a pull up bar. Use assistance if necessary. Use a band, small jump, toe on a chair, or a friend holding your feet to help take some weight. Lock off at the top of the pull up for 1- 3 secs depending on your strength. Lower to 3 more positions from the top. Lock off for up to three secs at each position. These lock offs should be controlled. Try not to drop into the shoulder joint at full extension. Do 3 – 5 reps in a row, depending on your strength. Rest 5 minutes between sets and repeat 3 – 5 times. Again, reps, rounds and technique variation will depend on fitness. While resting, load up a pack, wear a weight vest or hold something heavy (15 – 30#). Do weighted calf raises, ideally, in your ice climbing or mountain boots. Calf raises can easily be done on a step. Do 10 calf raises every minute on the minute for 3 minutes. In other words, start the clock or timer for 1 minute. Do 10 reps and rest for the remainder of the minute. When the second minute starts, do 10 reps again and then rest for the remainder of the second minute. Do the same for the third round. Three rounds/minutes will use 3 minutes of your 5-minute rest. Fully rest the remaining 2 minutes. Go back to the pull-up-lock-off drill. Repeat both exercises 3-5 times. This calf workout in between lock off practice is a great combo for ice climbing. We all know core work is critical. 60 sec plank one foot off the floor for 30 sec then switch elevated foot. Train muscular endurance for ice climbing this season! Ice climbing is different. There are no crimpers or slopers. You always have a jug to hold onto—your tools! But swinging a tool overhead, holding on while placing or removing protection, longer pitches, the weight of winter gear (boots, crampons and multiple layers of clothing) and often climbing with a pack, all add up. Ice climbing can give you a full body pump and gas your arms like never before. So, we need to train muscular endurance. First, before you start to train, you should determine if you are on your game strength-and-fitness-wise. Head to the climbing gym with your climbing pack and approach shoes or light-hiking boots. Load your pack with a few full water bottles (start with 8 – 10 lbs). Pick easier routes to focus on big muscles. Steep is still ok, but with big holds. Wear your approach shoes or light-hiking boots to climb (if the gym is ok with it). The point is to climb with shoes that are less precise then climbing shoes. Use the auto belay or find a partner who is stoked to train too. Climb continuously for 10 minutes. Climb up and down. Don’t lower or rest on the ground. While you are climbing, practice working through the pump: shake, breathe and keep moving. We are working on stamina. Try four rounds: 10 minutes of continuous movement, followed by 10-15 min rest. Work/rest can be alternated with a training partner using a you-go, I-go approach. If you are training on your own then do mobility work, foam rolling, and core work during the rest period. If four rounds goes well, increase the time you stay on the wall or add more weight, or both for the next session. This workout will give you a full upper body pump and a nice pump in the arms too, for “icing” on the training cake! 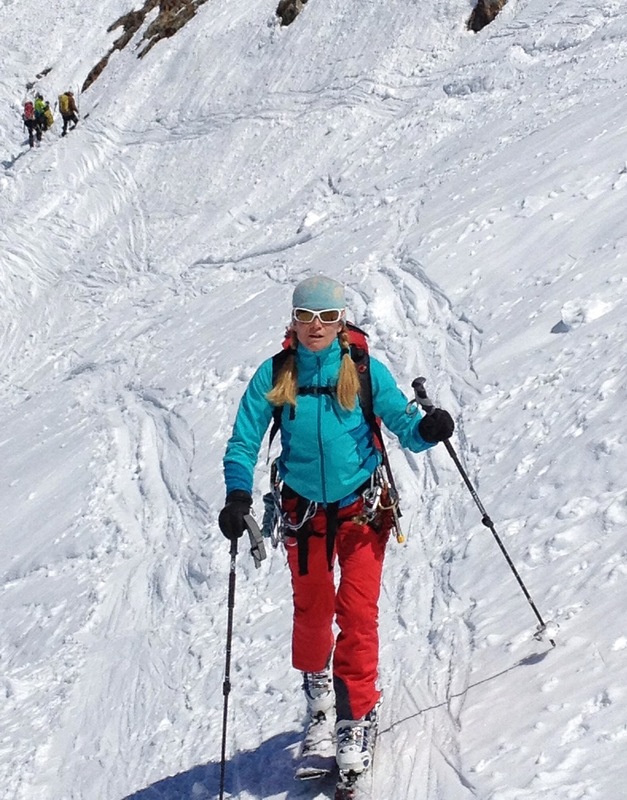 Enjoy and get the stoke high for the Chicks Ice Season!! All outcome-based training must be laid on a solid foundation. So let’s check in first. 1) Do I have a well-developed cardio vascular system, good resting heart rate, rapid heart rate recovery? Do I have a regular aerobic fitness program, 4 – 5 days a week 30 – 90+ minutes? 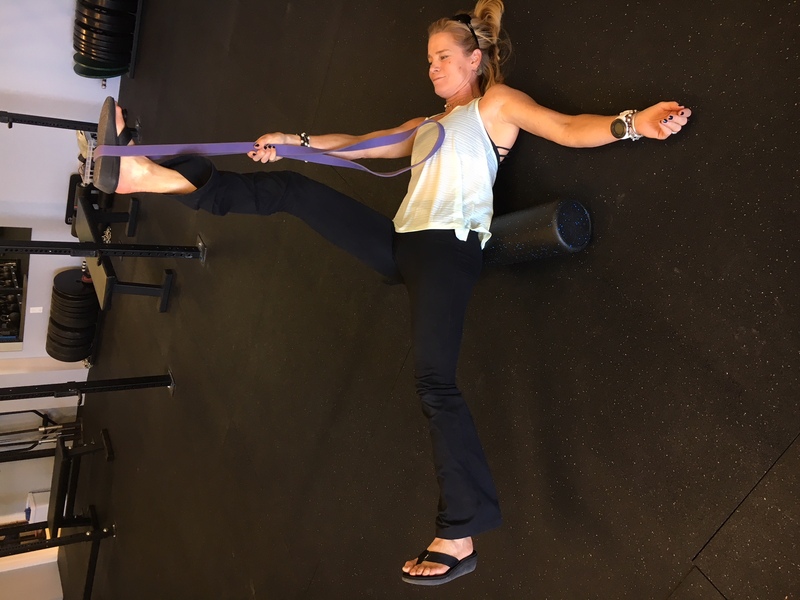 2) Have I addressed my postural and mobility issues? Do my joints have good range of motion? Have I taken steps to correct my posture if necessary through yoga or other stretching routines? 3) Do I have a well-rounded, balanced strength base on which to begin more difficult training to avoid injury? This could come from rock climbing, body weight workouts, or gym strengthening classes, or best yet all of the above. If you answered NO, you will benefit not only in your climbing but also in your health, life and injury prevention if you build foundational fitness first. Please reach out to me directly if you are interested in an online coaching plan carolyn@rippleffectraining.com. If you can say YES to all of the above let’s dive in! Ice climbing is a unique sport. It requires strength overhead to swing an ice tool, solid core strength to stabilize the body while swinging and while moving upward on single points of contact, good leg strength and muscular endurance, especially calves, to hang out on front points while placing gear or finding the perfect tool placement. Following are some strength exercises that will help you get fit for ice climbing. Pull Ups on 1” dowels or your ice tools to orient hands and forearms into the necessary alignment for ice climbing movements. Strict Press, although this is considered an arm/upper body movement, it’s also a test of “core” strength to stabilize mass overhead. KTE (knees to elbows) arms locked off if possible, this will also help with grip strength. Do these on dowels as well. Anchored Leg Lowers, legs weighted with light med ball or ankle weights if appropriate, mimics weight of boots on feet. KB Swings and Ball Slams will help you “learn” to effectively use your hips and legs while climbing. 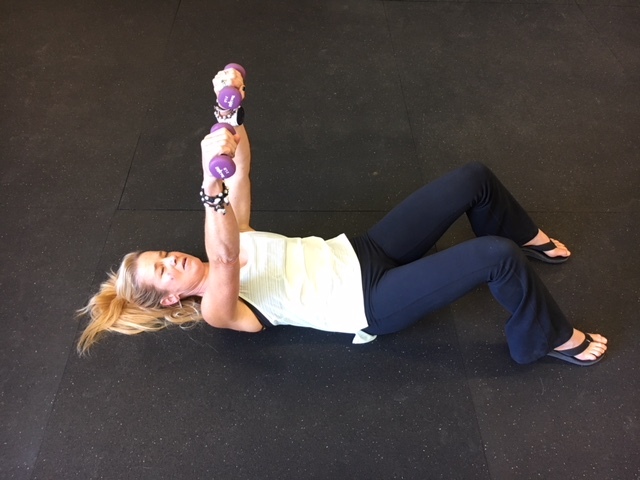 Both are “hip, glute, leg” driven movements but also challenge grip strength, core strength, and are so complex that they become a great challenge for the cardio vascular system. Calf Raises: Perform standard calf raise on a step or platform for 30 seconds. Complete as many reps as you can but don’t go crazy! This gets hard fast. Then hold a static position, feet parallel to floor for 30 seconds. Then go right back to 30 seconds of calf raises for the second set. Don’t rest until all rounds are complete. Begin with a few sets of 30 secs work/30 secs hold. Then increase the challenge by doing more sets. Walk around bit afterward and stretch. Note: If you hike, run, bike, your calves are tight! This can be broken into two different workouts if the volume of work is too much. You can supplement with the other movements that are referenced above. And most importantly have fun with this and your ice climbing season! The monsoon is past. The temperature has dropped. Rosehips are a deep pink. Rock Season is in its height. Fall is the time to climb hard, a ton. But as much as climbing feels good, it can imbalance you. Climbing a ton can create “negative movement patterns,” or what I call, Too-Much-of-a-Good-Thing syndrome. Negative movement patterns create muscle imbalances that can eventually lead to injuries. My Focused Balancing Workoutcan help you stay injury-free during peak climbing season and year round! 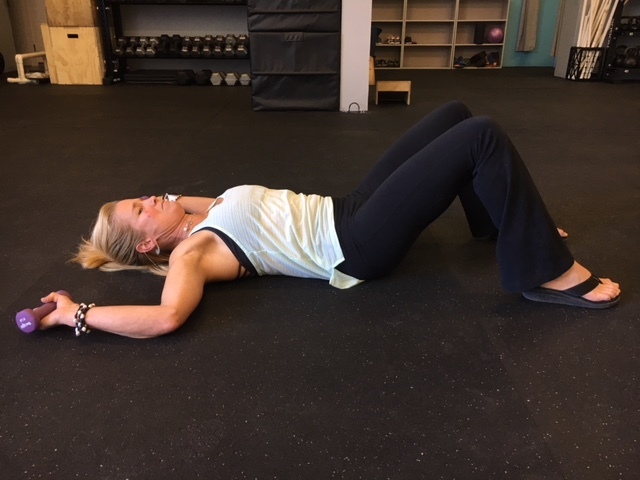 Cool down with more chest and hip mobility. Shoulder Stretch. Can be done on a foam roller or bench for more stretch. Chest Opener. Can be done on a foam roller or bench for more mobility. We’re in the height of climbing season and hopefully you’re all getting out and having fun! Whether you’ve set goals for alpine climbing trips, multi-pitch routes, just generally climbing harder, or learning this awesome sport of climbing for the first time, what I find consistent with all the athletes I coach is not having realistic expectations of progression, which ultimately leads to frustration. It happens to all of us: I can remember a time in my early twenties (that was a long time ago mind you) that I got so frustrated with my “lack” of performance on a climb I swore I was going to sell my rack. Ok, so I didn’t, but I wanted to. Sometimes frustration can be a motivator for sure, but sometimes it can undermine our confidence and even take the joy out of the sport. Over the last few years, I’ve endeavored to give you all training program outlines for climbing and skiing fitness, outlined strength training programs, created progressions and tools for improving, but now I’d like to fill my role as a coach to talk about the “process” of climbing as far as getting better. So often we are our own worst enemy, putting too much pressure on ourselves or having unrealistic expectations about progress, where we should be, and what it takes to break through a plateau in our climbing. Repeat these words to yourself whenever you’re in doubt. First: all climbers have been afraid. Second: everyone worked hard to be where they are. Fourth: everyone has cried about it at some point, or had a tantrum, or sulked, or gone into some crazed depression…I know, just over the sport of climbing. Embrace this and know it. If you see people climbing hard, understand they worked to get there. If they can’t admit their struggles to you, they are a douche bag. Ignore them. 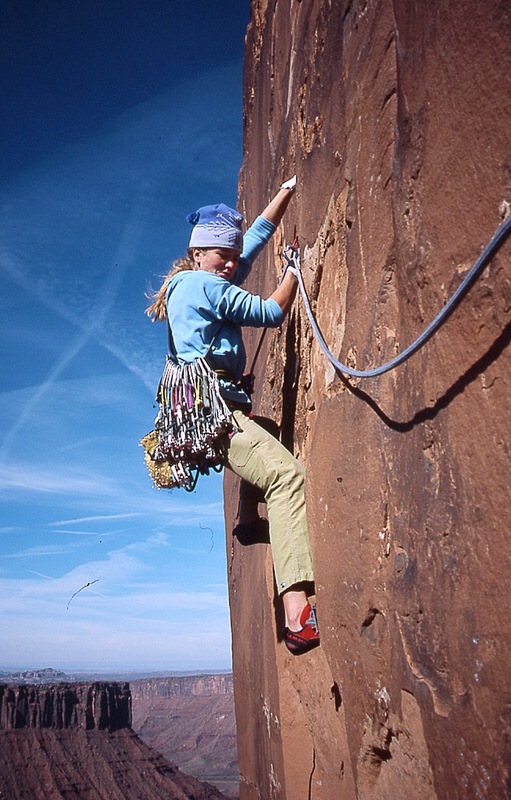 All climbers begin by steadily improving and working through the grades, sport or trad. Just by going climbing and trying you will get better. At some point, however, you will hit your first plateau. 5.9, 5.10, 5.12 wherever it is; believe me there are many plateaus to be hit, you will hit yours. At this point the process requires a different approach. Suddenly you need to “train” in a more structured manner, and you need to fail, and then try and try and try again to succeed if you want to gain the skill, strength, and ability to climb beyond your plateau. Many people are afraid of “failure” but failure is part of the process. Everyone that is good at anything has had to overcome failures. If you’re not trying hard enough to fail you won’t beget success. Challenge yourself to try routes or boulder problems that you think you can’t touch. So you can only link a few moves at a time… Perfect. Two things happen when you try. First you become stronger, finger and contact strength, then your body begins to “learn” new movement. Feel confident and comfortable enough to rehearse movements. Then begin linking moves. If you try a new route or boulder problem and in one week you manage to get one move further you’ve made progress. Try and fail try and fail try and fail…then try and succeed! Once your body understands what it feels like, what it takes to climb the next grade harder the next route will be easier. Mentally and physically. 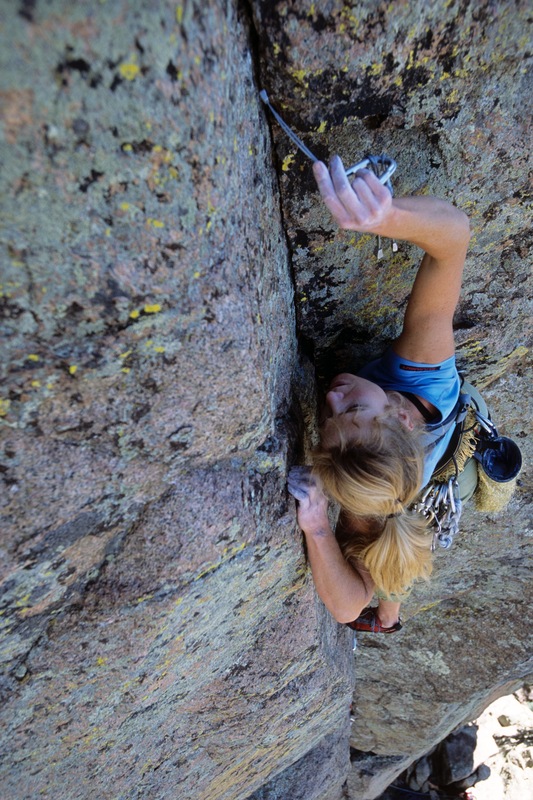 Try backcountry routes or longer trad climbs that make you nervous. Go with a competent partner. have the skill and knowledge to complete the climb but back off if you need to. Every time you are out you learn, over time that volume of experience will give you the confidence to try bigger, harder, more advanced climbs. Many athletes reach out to a coach to give them guidance on a wide range of topics, including how to use their limited time best to train, video movement analysis to climb more efficiently, programming for specific training, or accountability to get the work done. Whatever the need, there are people to help support progressing climbers. Seek the guidance of mentors as the support of others with more experience can be a game changer in giving you the confidence to try. A mentor can even save your life; in the big mountains where the game has greater consequences their advice may make all the difference. It’s ok to be hard on yourself but not too hard…set reasonable expectations. If you are new to the Chicks Training Tips take a few minutes to read the previous newsletters, there’s a lot of great information in there! We are in the thick of alpine climbing season in the US, Europe, and parts of South America. If you have a trip coming up, or you are plotting for next year’s ambitions, we’ve got some training tips for you. The last training tip discussed how to get the stamina built for long back to back days in the mountains, while still having a job, life, family, all the demands of a busy schedule. Now to complement the stamina we need STRENGTH. Fortunately if we do quality focused work one to two days a week in the gym for an hour, that’s plenty of time to build a quality strength base for your alpine endeavors. We need to have strength in our legs to tolerate not only the nature of the uneven terrain and the weight of the pack but also to protect our joints, especially our knees, so we can climb for years to come. To get legs and core strong for the mountains, two of my favorite two leg or “close” chain movements are the deadlift and front squat. Just as important are these: single leg movements for glute strength, balance, and hip stability; Single Leg Straight Leg Deadlift (SLSLDL), split squats, and weighted step ups. 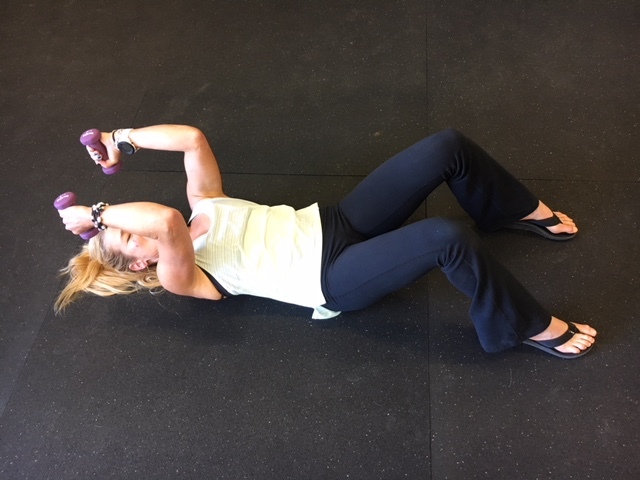 Here are a few sample workouts (WO) to give you guidance in working these movements into your routine as training for alpine climbing. These can be done just once a week in addition to your other training or two times if you are recovering well. Work up to something that’s heavy for 3 reps (3RM) for your Front Squat. 8 x 3 Front Squats@ ______# rest 1 – 2 minutes between sets. 1-10 Squat Ladder with a partner. Partners begin holding in a quads parallel position at the bottom of the squat movement. Person 1: does 1 rep while P2 holds. P2 does 1 rep while P1 holds. P1 does 2 reps while P2 holds, P2 does 2 reps while P1 holds. Continue until you complete the ladder to 10. No cheating. Work up to a weight that is heavy for a step up. Ideally use a bar bell on your back or two Kbs held in front rack position. 5 x 5 Step up in 16 – 20” box depending on your height, box should be lower than your knee cap. complete 5 step ups per leg with weight that makes the movement challenging, slow grinding movements. All the movements can be found as videos in the Chicks archives.